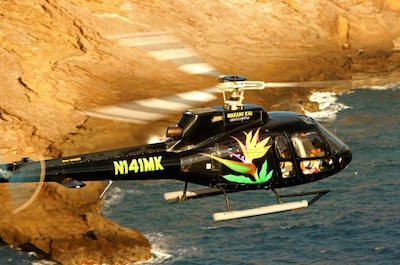 Below are the best Oahu helicopter tours! Many people only dream of flying in a helicopter over the island of Oahu like Magnum PI or Danno from Hawaii Five O. You will experience new height of adrenaline as you soar through the blue skies of Hawaii over such iconic sightseeing spots as the North Shore, the Banzai Pipeline and the incredible white sand beaches of Sunset as well as Waikiki. You will fly over and peer down at the 1,000-foot waterfall known as Sacred Falls as well as gaze upon the beautiful tropical forests of the Ko'olau Mountains. 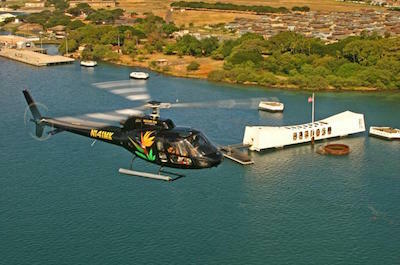 Fly over Pearl Harbor, Diamond Head and more when you decide to indulge in a memory filled helicopter ride. When you are tired of the crowds while taking a land based tour then you really need to think about taking the 45-Minute Oahu Helicopter Tour: Hidden Oahu. This tour will fly you over all the best spots in a relaxing fashion while your expert pilot tells interesting stories of what you are watching on the ground. Your 45-minute adventure begins with complimentary hotel pickup service where you will be transported to a helipad near Waikiki Beach. Here you will board your state-of-the-art helicopter for adventure of a lifetime that will take you high into the air to view such fantastic spots as Aloha Tower, Honolulu Harbor, Magic Island and Ala Moana Beach Park. You will continue your adrenaline filled flight with a pass over of the eastern portion of the island where you can view Hanauma Bay, Sandy Beach, the Halona Blowhole and Makapuu Point. Your flight time does not stop here with fly overs of the beautiful white sands of Waimanalo Beach and the coral formations that reside at Kane'hoe Bay and around the famous Chinaman's Hat Island. This Oahu helicopter tour hits all the high notes of sightseeing as you soar above the Kualoa Ranch and the spectacular 1,000-feet Sacred Falls with its beautiful cascading waters over the volcanic rock formations. Your thrilling helicopter tour concludes as you fly above Pearl Harbor where you can see the most iconic attraction of Oahu from a completely different vantage point. When you land you will know that this was a special once-in-a-lifetime experience. When you are on Oahu and want to combine a couple excursions, then the Oahu Helicopter Tour with Sunset Dinner Cruise or Atlantis Submarine Excursion is the ideal way to combine exciting adventures as well as save some money. This helicopter tour iis a great value for people and includes a choice of combining your flight with a stunning sunset dinner cruise or a trip under the water in an Atlantis submarine. 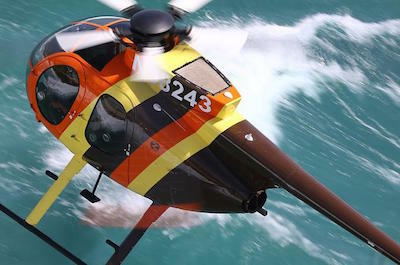 Your 30-minute helicopter adventure begins with complimentary hotel pickup from Waikiki where you will be taken to board a MD500 4-passenger helicopter. When you take-off you will feel the adrenaline rush through your body and when you look down you will see the beautiful Keehi Lagoon and historic Honolulu. You will fly over â€˜Iolani Palace and the Punchbowl National Cemetery before passing above Waikiki Beach, Ala Moana Beach Park and Magic Island. Here you will get a great view of Diamond Head and the serene Hanauma Bay. Your flight continues as you soar past Makapuu Point and finish your flight watching the incredible scenery below at Mount Olomana as well as the cliffs of Nuuanu Pali. The second phase of this excursion involves a choice of a 2-hour romantic sunset dinner cruise or an unbelievable ride in an Atlantis submarine. If you choose the sunset dinner cruise you will sail along the coastline of Waikiki along a 10-mile stretch of the Kahala Gold Coast where you will enjoy a superb meal and a sunset of pastel colors draping the skies over the Pacific Ocean. The Atlantis submarine portion of your Oahu helicopter tour is also fascinating when you board a specialty designed submarine that submerges down to 100-feet in the Pacific Ocean where you will have excellent views of the marine life and gorgeous coral reefs. You can watch sea turtles, spinner dolphins and even sharks swim around the Atlantis submarine as you sit comfortably behind large viewing windows. The Oahu Sky and Combo: Helicopter Tour with Sunset Dinner Cruise or Atlantis Submarine Excursion concludes with drop-off service back at your Waikiki hotel. 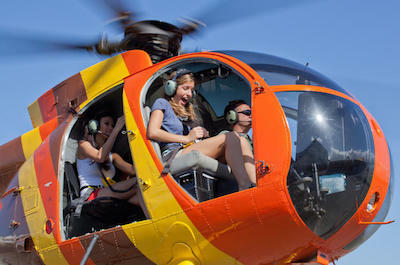 Get your adrenaline flowing and take to the blue skies of Hawaii on an Open-Door Oahu helicopter tour. Your 45-minute exploring wonder begins with a complimentary hotel pickup service in Waikiki where you will be taken to your flying chariot. This helicopter tour in Oahu is a fantastic way to see everything from a unique vantage point that will leave memories in your mind forever. When you take-off on your 45-minute open-door helicopter tour over Oahu you will witness incredible scenery as well as a jolt of adrenanline running through your veins. You will pass over such iconic spots as Waikiki Beach, Honolulu Harbor, Keehi Lagoon, the gorgeous white sands of Hanauma Bay and watch the amazing water shoot out of the Halona Blowhole. Your pilot will give you all the necessary insights to each location when you pass over, so you will have a full understanding of the world below. You will continue on your flight over spectacular places like the Dole Plantation, Sandy Beach, Ala Moana Beach Park and Magic Island. You will witness Chinaman's Hat from a vantage point high in the air as well as the superb tropical environment of the Ka'a'awa Valley before heading to the highlight of your flight which is the 1,000-foot Sacred Falls waterfall which is only visible from the air. Your last sightseeing opportunity will be a pass over of Pearl Harbor where you can view the USS Arizona Memorial from high above. Your 45-minute open-door Oahu helicopter tour concludes when you touch down and are transported back to your Waikiki hotel. When you have limited time on the island of Oahu and want to see everything you can, then you need to take the 60-minute Oahu Helicopter Tour: Ali'i Sacred Falls. This tour is spectacular and your 60-minute adventure begins with complimentary hotel pickup service in Waikiki where you will be driven to your departure place. 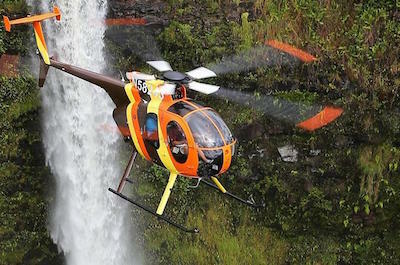 Once on board the 4-passenger helicopter you will take-off into the blue skies over Hawaii. You will have excellent vantage points to see Keehi Lagoon, Aloha Tower before flying over historic downtown Honolulu and the views of Diamond Head will astonish you as you soar above the tropical landscape. From here your flight takes you above the east end of Oahu where you will view Hanauma Bay, the Halona Blowhole and Sandy Beach before making your way to the lighthouse at Makapuu Point. You continue flying to Waimanalo Beach where the white sands sparkle in the sunlight and the beautiful coral reefs of Kae'ohe Bay are fascinating. Your next viewing opportunity will be Chinaman's Hat Island and the famed Kualoa Ranch where Jurassic Park was filmed. Your final fly over will include the incredible 1,000-foot waterfall Sacred Falls and a surreal look at the Dole Pineapple Plantation from high above. Your 60-minute Oahu Helicopter Tour: Ali'I Sacred Falls concludes when you make that perfect landing and are transported back to your Waikiki hotel. When you are ready for the excitement of viewing Oahu's beautiful scenery from above then you need to take the Walley's and Waterfall Explorer: Helicopter Tour of Oahu Valley's and Waterfalls. This Oahu helicopter tour is fascinating and your 40-minute begins when you lift-off from the helipad at the Turtle Bay Resort. During your flight you have the option for a no doors flight or a closed door flight depending on your comfort level of flying. Your adrenaline will reach new highs as you soar through the air above Oahu's northeastern coastline viewing spectacular scenery below which includes Kahana Bay, Banzai Pipeline Sunset Beach, Waimea Bay, the Ko'olau Mountains, Kane'hoe Bay and the stunning cascading waters of Sacred Falls. While you are flying your expert pilot will also be your tour guide relaying interesting facts about each place as you pass over each location. If you want to add another 20-minutes this helicopter tour will land on a remote mountain at Kualoa Ranch for an incredible photograph opportunity. Your Valley's and Waterfall Oahu helicopter tour concludes with a gentle landing at Turtle Bay Resort. 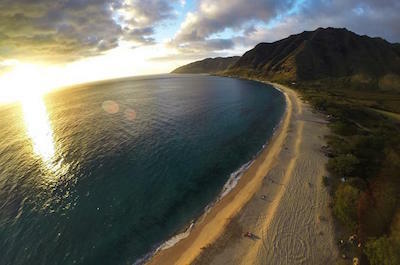 If you want to see the North Shore of Oahu like never before then you need to go on the Doors Off Helicopter Tour in Oahu North Shore Sunset Ride. 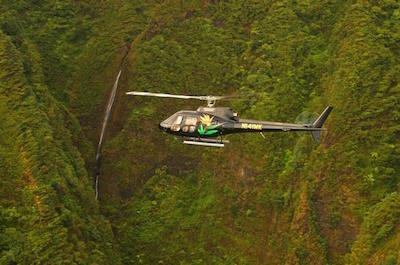 This 40-minute helicopter tour in Oahu is one of the more popular flights you can take while visiting Oahu. Your flight begins from Turtle Bay Resort helipad where you board a MD500 helicopter that seats 4-passengers. Your adrenaline will start to rush to new levels as you take-off into the air just before sunset. As your flight starts you will be treated to views of the Ko'olau Mountains, historic sugar plantations and the laid back town of Haleiwa. As you are flying above these sights your expert pilot will interject interesting commentary on the sights below to give you a full understanding of what you are watching on the ground. As you soar above Waimea Bay you can catch a glimpse of the huge waves at the Banzai Pipeline and the superb white sands of Sunset Beach. Here as the sunsets in the horizon the colors of the sky will absolutely amaze you. You will have a chance to take photographs of Ka'ena Point which is the farthest western point on Oahu. Your Doors off Helicopter Tour In Oahu North Shore Sunset Ride concludes with a gentle landing back at Turtle Bay Resort. When you want to take a special excursion and see as much as possible of the North Shore then the Helicopter Tour on Oahu: North Shore Sunset Spectacular is ideal for you. This 40-minute helicopter tour in Oahu will take you to new sightseeing heights as you soar through the blue skies of Hawaii just before sunset. Your excursion begins at the Turtle Bay Resort helipad where you will board a MD500 4-passenger helicopter at which point you can decide to fly with or without the doors. As you take-off your adrenaline will rush through your blood stream and your first sights will be of the spectacular Ko'olau Mountains. While you are looking down at old sugar plantations you will soar above the little town of Haleiwa which is home to many of the finest surfing areas in the world. You will gaze at Waimea Bay, Sunset Beach and see the big waves of the famous Banzai Pipeline. You will fly over one of the most western points on Oahu in Ka'ena Point just as the sun is beginning to disappear in the horizon. Your eyes will view the beautiful blue Hawaiian sky turn into a mixture of pastel colors that will leave lasting memories for life. Your Doors Off Helicopter in Oahu North Shore Sunset Ride will conclude when your helicopter lands back at the Turtle Bay Resort helipad. The North Shore Adventure Helicopter Tour is perfect for you if you don't want to spend a whole lot time in the air and still see some of the most iconic sights on Oahu. This 20-minute helicopter tour in Oahu takes-off from the Turtle Bay Resort helipad and has many departure times throughout the day. You will board a MD500 4-passenger helicopter and liftoff into the blue skies of Hawaii. You will travel over fabulous scenery such as the bays of Kahana and Waimea as well as look below at the huge waves generated by the Banzai Pipeline. After passing over the white sands of Sunset Beach, you will travel above the Ko'olau Mountains where you will view the incredible 1,000-foot waterfall of Sacred Falls which can only be seen by air travel. Your senses will be alive with adrenaline and your mind will fill with memories as you soar over these sightseeing locations while your expert pilot explains the diverse environment of Oahu. Your North Shore Adventure Tour concludes when you land at the Turtle Bay Resort helipad with a smile on your face. 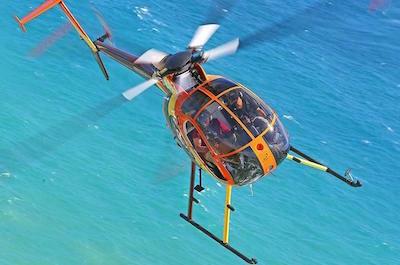 If you are staying outside of the Waikiki area or want to combine two activities together and save some money then the Oahu Super Saver: Helicopter Tour plus Dolphin Snorkel Adventure is the perfect Oahu helicopter tour. This 2-day excursion has two distinct activities for you to enjoy which include a 30-minute helicopter tour in Oahu and a speed ride to where you will then have a chance to snorkel with dolphins. Your Oahu Super Saver: Helicopter tour plus Dolphin Snorkel Adventure begins with complimentary hotel pickup service from your Ko Olina hotel only. If you are in the Waikiki area you must arrange transportation to the Ko Olina Marina. The first day of your adventure involves a 30-minuteOahu helicopter toursr the southern portion of the island where you will see iconic sightseeing locations as Queen Anne's Revenge before flying over Pearl Harbor and the USS Arizona and USS Missouri Memorials. While you are in the air your expert pilot will also be your expert guide and inform you of the importance of each sightseeing opportunity. 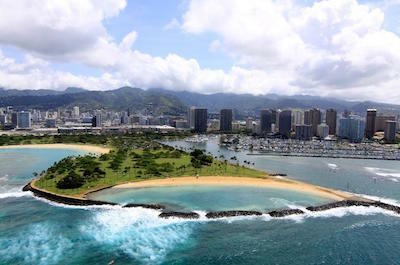 From here you will soar above the Aloha Tower, Punchbowl Crater, the Ala Moana Beach Park and Magic Island. Just before you land you will fly above the spectacular Nu'uanu Pali section of the beautiful Lo'olau Mountains where you can watch the water cascade down Lulumahu Falls. Day two of your Oahu Super Saver: Helicopter Tour plus Dolphin Snorkel Adventure begins with hotel pickup service from Ko Olina where you will travel to the Ko Olina Marina and board a speed boat. You will travel on this water vessel enjoying the gorgeous blue waters of the Pacific Ocean until you reach your snorkeling destination. Here you will enter the warm waters of the Pacific Ocean and snorkel with the entertaining spinner dolphins which have been following your speedy watercraft. You will swim with numerous brightly colored tropical fish including sea turtles as you snorkel by the coral reefs and you might even spot a humpback whale during the winter months. While you are snorkeling and swimming you will be treated a complimentary lunch of fruit salad and your choice of sandwich. Your 2-day Oahu Super Saver: Helicopter Tour plus Dolphin Snorkel Adventure concludes when you are transported back to your selected Ko Olina hotel. When you are interested in sightseeing along the Gold Coast of Oahu and want a different perspective then you should try the 30-Minute Oahu Helicopter Tour: Pali Makani. This tour begins with complimentary pickup service from your Waikiki hotel where you will be transported to board a 4-passenger helicopter. Once in the air you will feel the wind run through your hair and the adrenaline through your veins as you soar above the beautiful Keehi Lagoon. You will view the Aloha Tower, historic Honolulu and the National Memorial Cemetery of the Pacific at Punchbowl crater. Your adventure continues as your expert pilot tells you interesting stories about the history and natural wonders of Oahu as you gaze out upon Diamond Head. 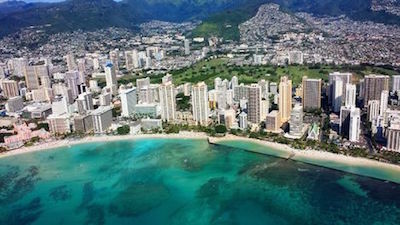 You will fly above such spectacular beaches like Ala Moana, Waikiki and get a glimpse of Magic Island as well as the USS Arizona Memorial in Pearl Harbor. Your Oahu helicopter tours concludes with a pass over of Makapuu Point, Mount Olomana and the sheer cliffs of Nuuanu Pali. After touching down you will be delivered back to your Waikiki hotel.